35° plate arc in lower center, 24° plate arc above it and slightly to the right, and faint infralateral arc (?) at far left. The angular distances from the sun still need to be measured, however. Dalton Highway, northern Alaska, April 17, 2006. The photo has not been manipulated. Copyright Walt Tape. A wider angle photo of the same display is here. A photo of another display, about 20 minutes earlier and ten miles further south on the highway is here; (then at "on assignment: arctic Alaska"). Walt, What was the solar elevation? Nice photo but every time I click on it get a not found error. The display is almost too much for a man to bear. Conserning the first linked image, was there 22 upper tangent arc, or is that purely lower 20 plate arc? To answer Marko: At the top of the 22halo was some very weak diffuse light, but nothing that would pass for a well-defined halo. A lower tangent arc would lead us to expect an upper tangent arc above the 22halo. A lower 20plate arc would lead us to expect an upper 23plate arc above the 22halo. Neither of the expected halos was there, at least not in intensity remotely consistent with the arc(s?) at the bottom of the 22halo. Also, the infralateral (?) arc, even though very weak, would lead us to expect decent tangent arcs. But, again, the upper tangent arc was not there. Can we argue that the crystal swarm is stronger lower down? 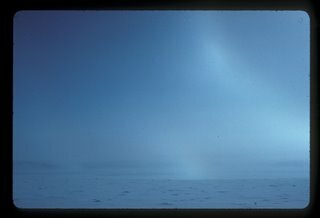 At Pole, as you know, we often saw bright lower tangent arcs at the horizon, with hardly any other halos. But in the Dalton display, the intensity of the display as a whole does not drop off dramatically with elevation. And can we really believe that we are seeing more crystals in the direction of the 35plate arc, below the horizon, than in the direction of the upper tan arc? It is a stretch, but maybe not impossible; it is clear from the photo that we are not in the midst of the crystal swarm---you can apparently see the edge of the swarm where it meets the snow surface. O.K., obviously I do not know what is going on here. It looks very interesting. Is this orginate in snow being thrown up or in diamond dust (by high air huminity)? There is now a simulation attached to the first linked photo. Be sure to open the eps file, which is way better. The simulation is pretty good but it is not without defects.